Navodaya Vidyalaya Samiti, Bhopal region Entrance Result or Selection Test Result for Admission in class VI for the session 2018-2019 has announced. As you know Odisha's all 30 district Jawahar Navodaya Vidyalayas comes under Bhopal region. so, now we have all selected candidates result, who are going to take admission in to Class VI in their respective District Jawahar Navodaya Vidyalaya. We extracted list of selected candidates list from Bhopal Region Result list. Click on below button to download All odisha list or click on any District name to jump in to directly to District wise list. 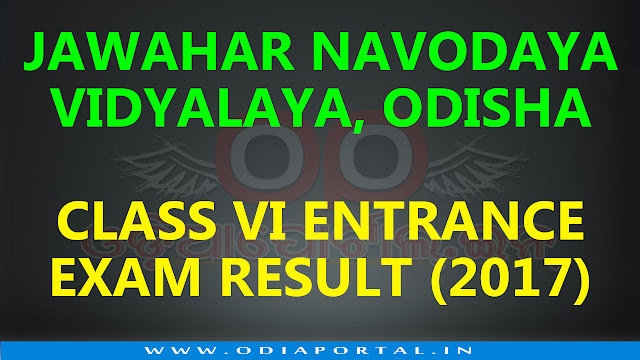 2018 RESULT AVAILABLE - CLICK ABOVE BUTTON TO DOWNLOAD 2018 RESULT LIST (ALL ODISHA)! NOTE: OdiaPortal.IN is not affiliate to either NVS (Center) or any district level JNVs of Odisha. This is completely unofficial website here to help you to get the results as soon as possible. OdiaPortal.IN doesn't take any responsibility for any Error in Name, Result or vice versa. For any problem or error in Name or whatever, parents can contact their district JNVs. Thank You! Sir, unable to download any .. Check it please.